How to determine what stocks are really worth and buy the best at a discount "e;The Five Keys to Value Investing is practical, insightful, and a great roadmap to not only value investing but how to make money in the stock market. "e; Joel Greenblatt, Managing Partner, Gotham Capital "e;Jean-Jacques has written a great how-to guide for both beginning and experienced value investors… . He skillfully draws on the canon and legacy of the great value investors, such as Graham and Buffett a terrific addition on this time-tested methodology. "e; Eric T. McKissack, Vice Chairman, Ariel Capital Management/Ariel Mutual Funds Investors left to pick up the pieces of the shattered stock market are rediscovering value investing the time-tested technique based on assessing and buying businesses as opposed to "e;picking"e; hot stocks. 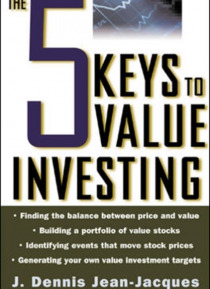 The Five Keys to Value Investing provides a methodical framework for using value analysis to uncover investment opportunities based on their business strengths, and building a solid portfolio of stocks that is destined to provide superior long-term returns. Written by a professional value investor who worked for the best, The Five Keys to Value Investing explains how to answer the four basic questions of value investing: Does this stock represent a good business to own? What is its balance between price and value? What specific events will spur it to appreciate? What are the stock's safety levels?